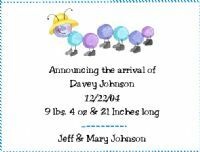 These adorable caterpiller baby announcements are perfect for announcing your new baby to friends and family. Announce your baby with style, send a Carries Kiddie Closet Baby Announcement. Check box if you would like to include items with your baby announcements. Enter Personalization for baby announcements Here!